Class for handling updates to the site_stats table. Definition at line 27 of file SiteStatsUpdate.php. Definition at line 44 of file SiteStatsUpdate.php. References $edits, $pages, $users, edits, and pages. Definition at line 238 of file SiteStatsUpdate.php. Definition at line 209 of file SiteStatsUpdate.php. Definition at line 150 of file SiteStatsUpdate.php. References $dbr, $services, DB_REPLICA, RecentChange\getQueryInfo(), ActorMigration\newMigration(), RC_EXTERNAL, SiteStats\unload(), and Wikimedia\Rdbms\IDatabase\update(). Referenced by SiteStatsInit\doAllAndCommit(), and InitSiteStats\execute(). Definition at line 84 of file SiteStatsUpdate.php. 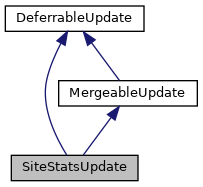 References DeferredUpdates\addCallableUpdate(), doUpdateContextStats(), and doUpdatePendingDeltas(). Definition at line 186 of file SiteStatsUpdate.php. Definition at line 196 of file SiteStatsUpdate.php. References adjustPending(), edits, and pages. Referenced by doUpdate(), and tryDBUpdateInternal(). Definition at line 66 of file SiteStatsUpdate.php. Referenced by MediaWiki\Auth\AuthManager\autoCreateUser(), MediaWiki\Auth\AuthManager\continueAccountCreation(), Installer\createSysop(), LocalFile\delete(), WikiPage\doDeleteUpdates(), MediaWiki\Storage\DerivedPageDataUpdater\doUpdates(), LocalFileRestoreBatch\execute(), WikiImporter\finishImportPage(), LocalFile\recordUpload2(), WikiPageDbTestBase\testDoEditUpdates(), SiteStatsUpdateTest\testDoUpdate(), and SiteStatsUpdateTest\testFactoryAndMerge(). Definition at line 253 of file SiteStatsUpdate.php. References $type, as, and BagOStuff\READ_LATEST. Definition at line 228 of file SiteStatsUpdate.php. Referenced by adjustPending(), and removePendingDeltas(). Definition at line 53 of file SiteStatsUpdate.php. Definition at line 277 of file SiteStatsUpdate.php. References $type, as, and getTypeCacheKey(). Definition at line 101 of file SiteStatsUpdate.php. References $services, appendUpdate(), DB_MASTER, doUpdatePendingDeltas(), edits, getPendingDeltas(), pages, removePendingDeltas(), and SiteStats\unload(). Definition at line 35 of file SiteStatsUpdate.php. Definition at line 41 of file SiteStatsUpdate.php. Definition at line 31 of file SiteStatsUpdate.php. Definition at line 39 of file SiteStatsUpdate.php. Definition at line 33 of file SiteStatsUpdate.php. Definition at line 29 of file SiteStatsUpdate.php. Definition at line 37 of file SiteStatsUpdate.php.